Gov. Scott Walker says health insurance rates for plans sold in the private market under the Affordable Care Act will drop next year by more than 4 percent. Walker attributes the reduction to a new reinsurance program he signed into law this year that takes effect in 2019. It's a $200 million program that's part of Walker's plan to lower health insurance costs in Wisconsin by subsidizing high-cost medical claims with a mix of federal and state money. Wisconsin is one of seven states that received federal permission to implement a reinsurance program. "Wisconsin, in recently adopting its reinsurance program, joined other states in embracing this model after a similar ACA-run program had expired," explained Donna Friedsam, health policy programs director at the University of Wisconsin-Madison Population Health Institute. "The expiration of that prior program contributed, in part, to the substantial rate increases in the 2016-18 period. Reinsurance has proven effective in helping insurance carriers offer coverage at lower prices to consumers. 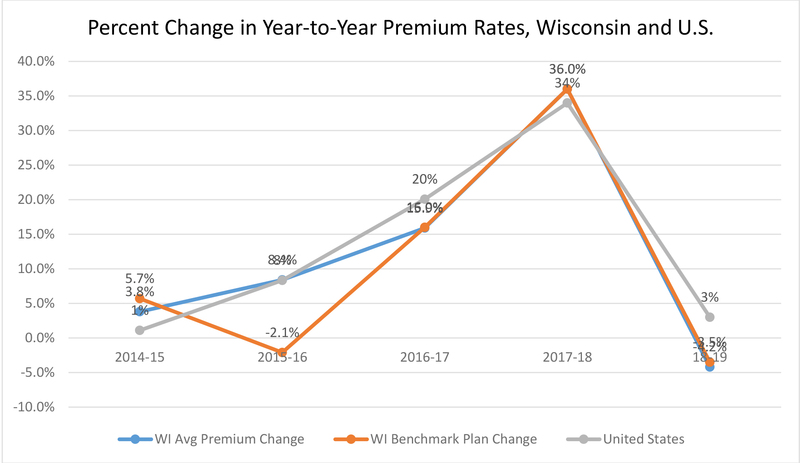 The lower premiums we see in Wisconsin are consistent with the trend we are seeing nationally as well, and for a variety of reasons, Wisconsin’s premiums and health care costs have generally been higher than those of neighboring states and nationally, which perhaps offers extra room for reductions." Walker on Thursday said the 4.2 percent reduction estimate was based on rate filings received by the Wisconsin Office of the Commissioner of Insurance and a report completed by Wakely Consulting Group. That report notes their estimate may be affected by political uncertainty which could impact outreach. The Trump administration has reduced funding for ACA advertising and outreach. The estimates could also be impacted by pending legal cases. Twenty states, including Wisconsin, are suing to strike down the ACA. Under the program, the government will provide money to health insurance providers to pay about 50 percent of medical claims costing between $50,000 and $200,000 starting next year. Earlier this year, Walker's office had estimated a smaller rate decrease of 3.5 percent. Editor's note: This story was updated at 2:30 p.m. Thursday, Oct. 11, 2018 with original reporting by WPR staff.